Carry on to Kinlochmoidart then on to the famous tea room at the Ariundle Centre at Strontian. After great food take the road back to Strontian before heading to Corran and back up the West side of Loch Linnhe to return to Off Beat Bikes in Fort William using the Camusnagaul ferry which runs to the Crannog Restaurant, across the road from our back door. See the detailed route on Google Maps here. 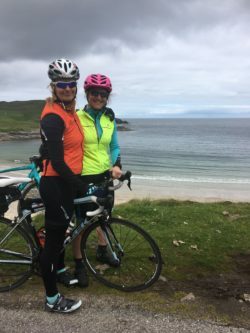 Take the West Highland 100 Cycle Route Challenge. You can complete the route in 1, 2 or 3 days. 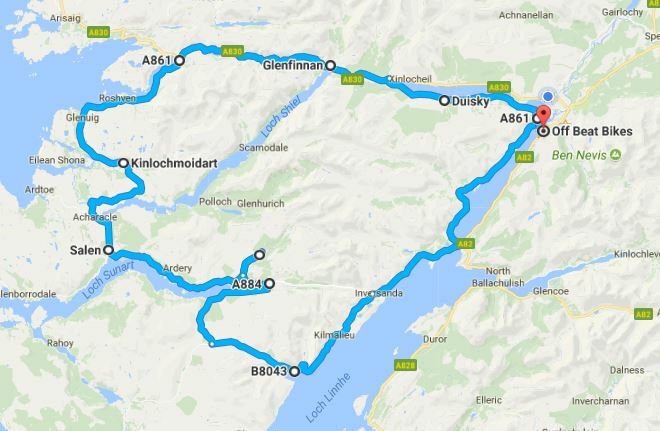 There’s plenty of guest houses and Bed & Breakfasts along the way or alternatively you could do it all in a day. For bike hire we can offer you a touring bike with flat or dropped bars along with all the panniers and racks to take your luggage with you. Alternatively, for the 2 or 3 day option, book an electric bike so you won’t be worried about keeping up. Email us to book your hire bikes and help you with your accommodation! Information and times for the small ferry you need to take at the start and end is here. Dougie, that runs this ferry, can be contacted on 07826695160 or 07468417137. For more cycle routes see here.